Company Theatre is a community-run theatre organisation based in The Rose Centre, Auckland, New Zealand. The smooth running of Company Theatre needs the dedication and commitment of a variety of special people. For 2013, the following Members are valued as Head of Departments. Some of them have been doing their part for Company without the title for many years - but we shouldn't take anything for granted, and we'd like to mention their continued support for 2013. This is great news to our Directors and Production Managers as we put a show together. Scott Thomas: Technical - Advisor for 2013 shows – Lighting and Sound. Cathie Sandy: Head of Wardrobe – Wardrobe Advisor for 2013 shows. Alastair Fletcher is our Bar Manager for each production this year and a special mention to Fred and Doreen Gould who do most of our property collection and sorting but may not be able to do all shows for 2013. We have many other people to help from show to show. These are a very important part of Company Theatre. We need many helpers for each production. Some to serve the tea and coffee, some to usher, one to sell the programmes, and some to help on the Bar. About a month before each production we will send a short email asking if you have the time to volunteer for FOH. You will be welcomed by your FOH Manager on the evening of your roster. Responsibilities will be fully explained before hand. But we do ask you to become a Member of Company Theatre. If you know you will be available for FOH for Calendar Girls 6 – 27 April, please email sherryede@hotmail.com now. She will keep a list! As a FOH volunteer you will get an opportunity to see our shows, and to enjoy a drink at the bar at our Member’s Rate when you come! Happy New Year and welcome to 2013 with Company Theatre. Details of the first two shows are already on our website. 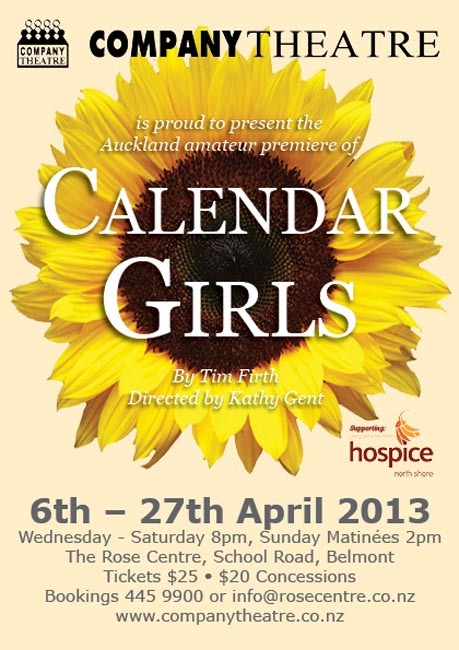 Rehearsals for Calendar Girls have begun and bookings are coming in quickly. See our BOOKINGS page for regular updates. Nearer the time of the show, we regularly update this page with the SOLD OUT nights, so you can check before booking. The Committee is delighted to have obtained the rights to produce The Last of the Summer Wine - just released for amateur production from January 2013. We will be the first in Auckland at this stage. A great night’s entertainment at the theatre - and a fine way to end 2013 with Company. We would also like to extend a warm welcome back to Des Smith, who will be directing this production. Des has acted with Company Theatre in the past and has directed many shows around Auckland. If you are interested in auditioning for this show, and would like any more information now (full details will be on our website soon) but you can email Des on dsmith@idc.com. Membership of Company Theatre runs from January to December, so it is that time of year again! Our AGM is set for Monday 18th February, 7.30pm at The Rose Centre, School Road Belmont. Notice of Membership Amendment.There will be a proposal for a change to the membership rate to put at the AGM. • The right to perform or help in our major productions, whether on stage, back stage or as a FOH helper. • Free Tea/coffee/biscuits during rehearsals and performance times. • Wine/beer at the Member’s rate, when in, or helping on a show including FOH."